This book presents the research that resulted from a fruitful collaboration between many CNRS research laboratories, health establishments and industrialists. This research contributes to the study and the development of logistical systems, in particular health-oriented logistical systems, in order to manage and optimize physical, informational and financial flows. 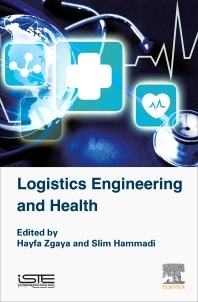 The authors examine optimization and modeling methods to facilitate decision support for the management of logistics systems in the health field, including solutions to problems encountered in the management of logistics flows and the study of systems incorporating these flows. In the first chapter, logistics engineering is presented whilst the second chapter introduces the study of real cases of transport, management crisis and warehouse management logistics systems. The third chapter is devoted to the study of hospital systems and emergency services and in the fourth chapter, the authors highlight the operational aspect of the hospital system thanks to an innovative modeling approach. Finally, mathematical and algorithmic models of scheduling, and dynamic orchestration of the collaborative workflow by a multi-agent system, are introduced. Academic communities of healthcare and biomedical engineering. Health establishments, executives, line managers, managers in a private or public health facility. 4.3 Why use a “workflow approach” in health? Hayfa Zgaya is Associate Professor of Logistics and Health Informatics at the Institute of Engineering in Health of Lille, France. Her main research areas are optimization, artificial intelligence and logistics issues. Slim HAMMADI is Professor of Industrial Engineering (Industrial Automation and Computer Science) at the Ecole Centrale de Lille (France). He obtained his PhD at the University of Lille I, on the subject of optimizing the scheduling flexible production workshops. In 1999, Mr. HAMMADI obtained his HDR at the University of Lille I, on the theme of modeling and optimization of complex systems. He is leader of the research group OPTIMA "Optimization, Models and Algorithms" and responsible for the OSL team "Optimizing Logistics Systems" CRISTAL laboratory CNRS UMR 9189. He is Senior Member of IEEE and IEEE player for several journals / SMC. Professor Hammadi co-chaired and chaired several international conferences in the field of logistics and transport and in the field of health logistics. His area of ​​teaching for production management (including scheduling), computers, dynamic programming and advanced techniques (soft computing) in combinatorial optimization in transport and health. His research concerns the optimization methods highly combinatorial systems with implementation of algorithms evolutionary strategy, fuzzy set theory, the AI ​​techniques, multi-agent application systems and the problems of hospital logistics, transport, crisis management and production systems.